TLV has launched a range of steam compressor systems that increase the energy efficiency of steam plant by recovering low-grade steam and converting it to higher pressures. TLV's SC helps recover excess low pressure steam, converting it to higher pressure steam for reuse. The SC range, which incorporates a high-efficiency ejector and either a COS or CV-COS control valve with built-in cyclone separator, converts excess low-pressure or 'flash' steam (typically 2 barg) to medium pressure steam (up to 5 barg) by adding high-grade motive steam. Instead of venting steam to atmosphere, the SC range can be integrated into any steam plant to reuse energy from post-process flash steam, as well as excess low-pressure steam produced by power generation. Depending on the control valve specified, the three models in the range - SC1, SC2 and SC4 - offer maximum intake flow rates between 250kg/h and 1,000kg/h at 2 barg, and PMOs between 10 barg and 16 barg. 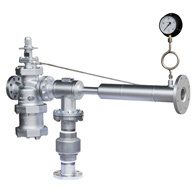 With a range of body materials - including carbon steel/stainless steel for the ejector; cast stainless steel for the check valve; and ductile cast iron, cast steel or cast stainless steel for the valve - and with various options for control valves and ancillaries, the system can be tailored to fit most environments and applications, including petrochemical, food processing and commercial laundries, and many other systems where excessive flash steam is available.